As progress continues on the project to reconstruct the State Route 435/Interstate 71 intersection, the Ohio Department of Transportation (ODOT) has announced that beginning Tuesday, Sept. 5, crews will begin resurfacing the two-lane section of State Route 435 between US 35 and State Route 729. Currently at the intersection, both directions of State Route 435 are shifted over onto the eastbound side while the contractor rebuilds the westbound lanes. As a result, State Route 435 traffic is reduced to one lane in each direction. Beginning Tuesday, the paving work east of the interchange will happen at the same time as the current reconstruction work near I-71, according to ODOT. – At 6 a.m., State Route 435 will be reduced to one lane of two-way traffic for resurfacing. Traffic will be maintained with flaggers. – At 5 p.m., both lanes of State Route 435 will be open. – Access to side roads and driveways will be maintained. The completion of this portion of the project is scheduled for Oct. 27. ODOT is reminding drivers to allow extra time to travel through the area due to the lanes being restricted. All exits are open, but reduced in width. The $10.6 million project is expected to be complete in November, according to ODOT. Crews continue to make progress on the reconstruction of State Route 435 near Interstate 71 and the Tanger Outlet Mall in Jeffersonville. 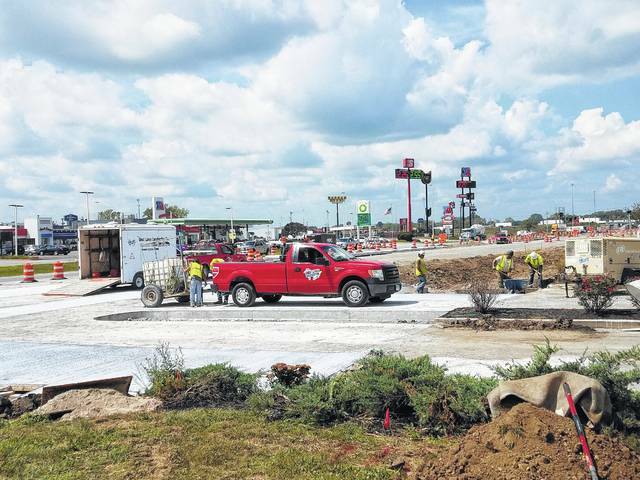 https://www.recordherald.com/wp-content/uploads/sites/27/2017/08/web1_20170830_133152.jpgCrews continue to make progress on the reconstruction of State Route 435 near Interstate 71 and the Tanger Outlet Mall in Jeffersonville.